"Nakakaiyak yung experience kasi these were foreigners doing a standing ovation," says Piolo Pascual (right) about their film OTJ (On The Job) getting a standing ovation in Cannes Film Fest. 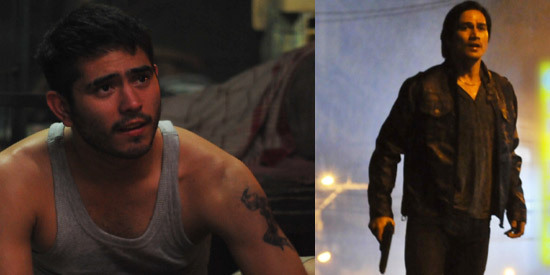 In the film, Gerald Anderson (left) is cast as an inmate who is being pursued by the NBI agent being portrayed by Piolo. Take two mentors training two proteges on opposite sides of the law and see them clash—this is the basic premise of the action-thriller OTJ (On The Job). On one side are law enforcers Sgt. Joaquin Acosta (played by Joey Marquez) and NBI agent Atty. Francis Coronel (played by Piolo Pascual) investigating an assassination ploy wherein inmates are secretly allowed to leave prison to work as hit men for corrupt government officials. On the other side is Tatang (Joel Torre) who is training fellow inmate Daniel (Gerald Anderson) as his apprentice gun-for-hire. After two decades in the entertainment industry, Piolo makes his first full-blown action flick after appearing mostly in romance movies on the big screen. "I think ito na ang first action film na ginawa ko," said Piolo during the bloggers' conference for the movie that will open in cinemas starting August 28. For the actor, one of the most difficult scenes that they shot for the film involved a long chase scene in the streets of Manila and extended to the MRT and even city hall. Piolo recalled: "Siguro ito yung habulan namin na sobrang pagod na kami, mga alas dos, alas tres ng umaga, naghahabulan kami sa MRT tapos lilipat kami ng location. "Then magse-setup si Direk ng ulan then patatakbuhin kami sa ulan then patutuyuin kami tapos tatakbo na naman kami sa ibang kalye. "Habang naghahabulan kami, naka-boots ka tapos may barilan. Pero other than that, it was a thrilling experience." He mentioned that his mother visited him on the set and even she was moved to tears while watching her son shoot a crucial scene in the movie. "There was a time when my mom visited the set, yun pa yung time na pinakamagandang eksena ko, naiyak ang nanay ko. Seryoso, naiyak ang nanay ko na ni-look forward ko sa pelikulang ito. "It's something different, something offbeat. Kinarir ko yun at inuwi ko kasi ang dami kong dugo." As for Joey Marquez, he says he was genuinely scared when he was inside a vehicle that got involved in a shootout. Joey narrated, "Hindi ko malilimutan yung pinagbabaril ako ni Direk habang nasa loob ng kotse. Lahat ng salamin, tumama dito. "I got scared actually kasi sinira talaga ang buong kotse na nasa loob ako." Director Erik Matti even describes one location as "hell." He says that their location was supposed to be an empty area but it became filled with people who wanted to get a glimpse of the celebrities. "The first day of that shoot was hell, hell talaga. "Grabe talaga yung tao. Squatter na punong-puno ng tao, it was supposed to be an empty squatter...na-clear muna tapos biglang pagtingala mo, may mga nakasilip." MULTI-MILLION BUDGET. Co-produced by Reality Entertainment and Star Cinema, OTJ (On The Job) boasts of a multi-million budget. When asked how much it cost to produce the film, Direk Erik answered, "There must be something about the film for it to be afforded this kind of budget. "Without promo, we are at around P47 million or almost P50 million." It was previously reported on PEP Alerts that the love scene between Gerald and Dawn Jimenez (formerly known as Dawn Balagot) took eight hours to shoot. Gerald says Direk Erik was "very classy" in handling his love scene with Dawn. During a separate bloggers' conference for Gerald, he says about his leading lady: "Pangalawang araw pa lang namin, love scene agad." "Kahit after nung love scene, medyo nakaka-ilang. It was only our second day pa lang nagsu-shoot yun na agad ang eksena namin." RECOGNITIONS ABROAD. OTJ was recognized recently during the 17th Puchon International Fantastic Film Fest in South Korea. Last May, OTJ made its world premiere during the 66th Cannes Film Fest. Piolo says that he was teary-eyed when OTJ received a standing ovation in Cannes. He admits, "It was really memorable kasi sa past experience ko sa Cannes, usually mabilis umalis ang mga tao dun. "Like after five minutes, tatayo na sila. So I was really sensitive. E, sa Directors' Fortnight, malaki ang theater niya. It was packed so sabi ko, kapag may tumayo dito, ibig sabihin bored na siya. "Nakakaiyak yung experience kasi these were foreigners doing a standing ovation...Naiiyak talaga ako kasi na-appreciate nila ang film natin and it was a truly memorable experience. "I felt proud being a Filipino and being with Direk Erik kasi siyempre, iba ang experience na madala mo ang karangalan ng Pilipinas. It's not just about yourself but it's about our country na mailabas natin at maipagmalaki natin sa ibang bansa kaya nakaka-proud. "Ang tagal ng standing ovation." REVIVING THE ACTION GENRE? Did the filmmakers intend to bring back the action genre through OTJ? Direk Erik pointed out: "I love action films pero at the heart of the film is a really good dramatic story. "Ang action, nandiyan lang siya pero ang kuwento talaga...it's something really interesting. Kahit bawasan ko ang action, the movie will still stand." According to research conducted by Direk Erik, there are inmates who are allowed to leave prison and become hitmen. PEP.ph (Philippine Entertainment Portal) asked the director if he became scared to push through with this movie because his film depicts the corrupt prison system and the involvement of the military in this scheme? "Ako, gusto ko lang gumawa ng movie like Enemy of the State or Bourne Identity. Dahil sa research, you touch upon sensitive topics. "Hindi ako takot. I feel mag-e-enjoy sila, makikita ng mga congressman ang mga sarili nila," says Direk Erik with a laugh. The director also points out that he had four consultants while doing this movie but they declined to have their names listed in the film's credits. "May military, political and NBI [National Bureau of Investigation] consultants. Noong unang cut ng edit, may credit sila...military consultant, political consultant, NBI consultant...[sabi nila], 'Direk pwede ba patanggal na lang ang names namin?'"